I start to train heelwork as soon as I get the puppy home and continue practicing practically every day of the dog’s life. What I do first is to reward the dog for voluntarily seeking out my left side and then I gradually increase the time it should walk there. First, I want to create an understanding that it pays to be at my left side and to follow me, then I add endurance and distractions. This is a perfect moment for a clicker and to train on the walk – reward the dog when it voluntarily walks by your side. Here Lena is training what I just described with her puppy Quling. She rewards him every time he spontaneously comes to her left side and also begins to reward him for walking there a couple of steps. From the very beginning, I am careful to give it a release cue when the dog is allowed to run away so that it does not leave the heelwork position when it feels like it. I also make sure that the dog follows me and not the other way around. I walk away, click and reward when the dog seeks out my left side and then turn quickly in the other direction so it will be a bit of a challenge for the dog to keep track of me. It doesn’t matter that the dog looks at me in the beginning, later on I will teach the dog to look ahead and walk alongside me at the same time. The important thing to remember in the beginning is to reward often – that’s what tells the dog that it is doing the right thing! When you’ve clicked and rewarded, try to click and reward again before the dog disappears from your side or has time to put down his nose to sniff the ground. Here Lena trains a springer spaniel who was a little hesitant (hence Lena’s eager peeping) and Elsa shows some heelwork training with Ludde (a calm guy) and Diesel (a little more intense). Actually, Lena could have rewarded even more often in the beginning. You see the last clips with Diesel how Elsa turns the training into a game where Diesel should try to follow her. On your next walk, count how many times your dog comes back to you and voluntarily walks by your side! I did an 8 minute sessions in the morning outside my house on a leash. Like 1 minute was off-leash and I click a lot when I have him off-leash because I don’t want him to loose focus. I did figure 8s and walked around my neighberhood. In the afternoon I did a 30 minute walk. Whenever the dog goes away from heel, I tap on my leg and click when he comes back to heel. He seems to be doing pretty good, but sometimes he does go past my leg so I walk in opposite direction and then click again. He has also learned that when my feet scrape against the ground I’m slowing down or stopping so he slows down, so sometimes I do this on purpose to slow him down and click. I ran out of treats though about 20 minutes in 🙂 . We tried the change direction method and after checking in about a dozen times he then chose to stay very close. As he was already close I did some running away and we both enjoyed that and he stayed close to my side. He is looking up at me which I don’t mind and for the last part of the session, in the distance there was a distraction of another dog, but he remained focused on me. Hopefully more of the same to come! Our daily routine is “find the right position”: I stand somewhere, dog is closing up, then turn in any direction, go back or forewards. I can do this at home. 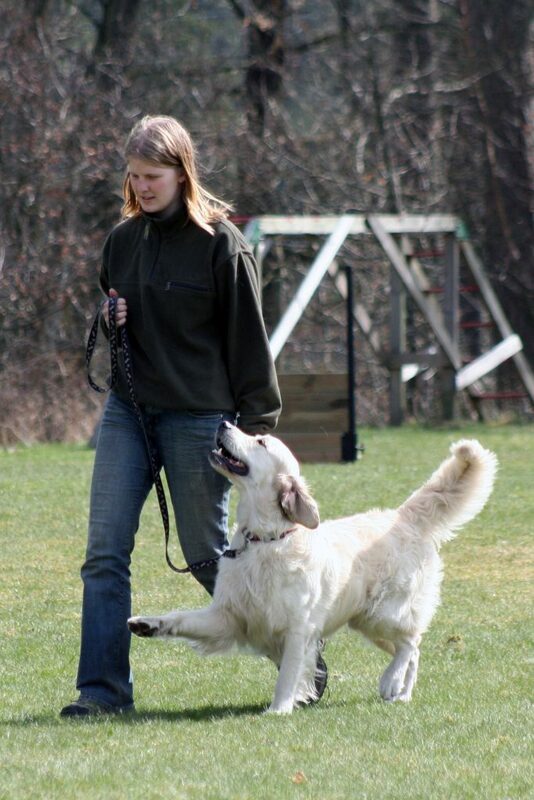 It should be fun and it is the startbutton of our training: easy and multiple reinforcement. After this stationary exercise we do dynamic heelwork.